A certificate of authenticity gives valuable detail to the art print collector, as well as reassurance that the giclée print has been produced to precise archival standards. 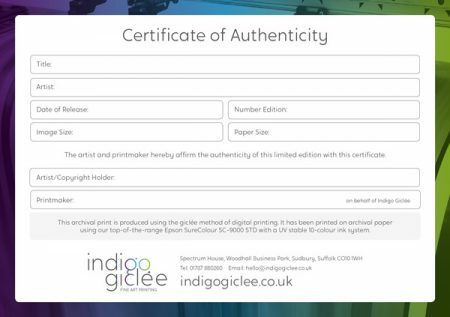 You can choose to add a certificate to your order as you work through the online order process for only £1.50 per print. Each certificate is signed by our master printer as your prints are checked. We include important information such as the date of production, the type of paper used and the fact that it is an official giclée print using approved archival pigments and paper.